This week in 2002, the 19th Olympic Winter Games began in Salt Lake City, Utah. The United States won 34 medals during these Games. Also in 2002, Daniel Bellig began working with Farrish Johnson Law Office. The opening ceremony for the XIX Olympic Winter Games was held on February 8, 2002 where athletes from 78 nations participated in 78 events contested in seven sports, including alpine skiing, curling, figure skating, luge, and snowboarding. The United States set the record for most gold medals at a home Winter Olympics, with 10, tying with Norway at the 1994 Winter Olympics. The US also received the most total medals at a home Winter Olympics, with 34 medals. The closing ceremonies of the 2002 Olympics included at the final live performance of KISS. Other artists performing at the ceremonies included Willie Nelson, Sting, Yo Yo Ma, Dorothy Hamill, Dave Matthews Band, the Mormon Tabernacle Choir and many more. Dan Bellig joined Farrish Johnson Law Office as an associate attorney in 2008. Dan is a lifelong resident of the Mankato area; he grew up in North Mankato and attended Minnesota State University, Mankato for both his undergraduate and graduate programs. He began working for Farrish Johnson in 2002. During law school at William Mitchell College of Law, Dan continued to work at Farrish Johnson while communing to the Twin Cities for classes. Also, in 2002, Senator Paul Wellstone was killed when his campaign plane crashed approaching a small airport in a wooded region in northern Minnesota. Wellstone was 58 years old. Originally from Arlington, VA, Wellstone accepted a teaching position at Carleton College in Northfield, MN, after completing his PhD in political science from North Carolina. In 1990 he ran for the U.S. Senate against incumbent Rudy Boschwitz and narrowly won. He defeated Boschwitz again in 1996. Despite his unapologetic advocacy of a progressive agenda, Wellstone was popular with his colleagues; he was described by one journalist as “one of the capital’s most beloved politicians.” In 2002 he campaigned for reelection to a third term. Then, on October 25, 2002, Wellstone, his wife Sheila, their daughter Marcia and three campaign staffers were travelling to northern Minnesota when their plane crashed near the Eveleth airport. There were no survivors. 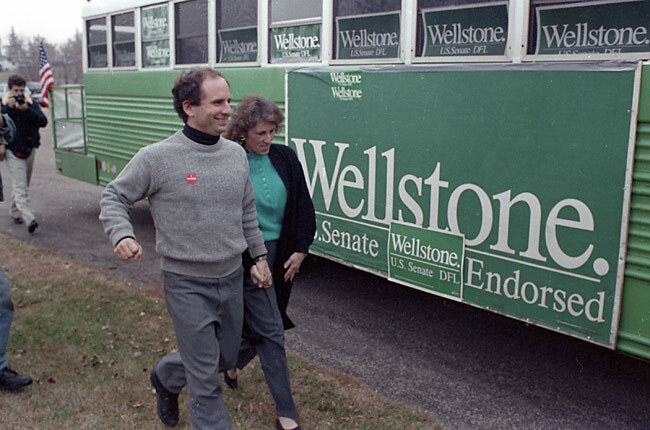 Paul Wellstone and his wife Sheila jog to their campaign bus after voting in the 1990 election. On February 22, 2002, Richard Davenport was appointed president of Minnesota State University, Mankato, by the Board of Trustees of the Minnesota State Colleges and Universities. He continues in this role today. Dr. Davenport earned his Bachelor of Arts degree in speech and hearing disorders at the University of Nebraska, Kearney, his Masters of Science degree in speech and hearing science at Colorado State University, and his doctor of philosophy degree in Higher Education Administration at Iowa State University. Dr. Davenport oversees several initiatives that help to enhance the University environment, including the President’s Commission on Diversity and the President’s Commission on the Status of Women. Dan Bellig’s practice areas include personal injury, wrongful death, class actions, privacy violations, business litigation, and appeals. He focuses on complex litigation matters, including high-profile plaintiff cases, class actions and defense of electrical utilities. He has been involved in numerous settlements of automobile accident claims for liability and underinsured policy limits as well as worked to resolve multiple medical privacy and statutory privacy claims. Additionally, Dan is involved in appellate work, research and writing for all types of litigation matters in trial court and on appeal. Dan is an adjunct professor at Minnesota State University, Mankato, in the Human Performance Department. He has been included on the Minnesota Rising Stars list since 2012 and in 2011 was named Attorney of the Year by Minnesota Lawyer. Excerpt from Charlotte Farrish’s letter to Joe Bellig in 1936. Dan, his wife and their four children live in the Mankato area. He has been involved with a variety of community organizations, including the Blue Earth County Historical Society, VFW Men’s Auxiliary, and Habitat for Humanity. February 3, 2002: New England Patriots and Tom Brady win Super Bowl XXXVI, beating the St. Louis Rams. Brady was named MVP. March 1, 2002: US invasion of Afghanistan: Operation Anaconda begins in Eastern Afghanistan with US Special Operation Forces. April 9, 2002: Funeral of Queen Elizabeth, the Queen mother, at Westminster Abbey, UK. May 12, 2002: Former US President Jimmy Carter arrived in Cuba for a 5-day visit with Fidel Castro, becoming the first president in the US, in or out of office, to visit the island since Castro’s 1959 revolution. 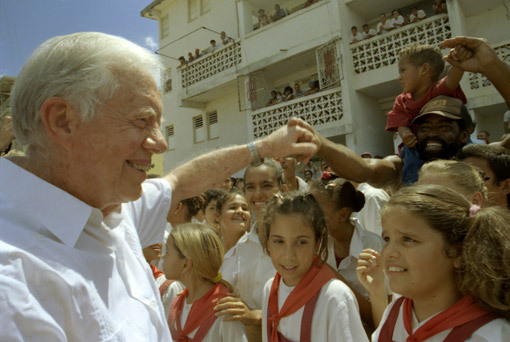 Former U.S. President Jimmy Carter shakes the hands of eager schoolchildren during his historic trip to Cuba. June 5, 2002: 14-year-old Elizabeth Smart kidnapped from her bedroom in Salt Lake City, UT. She was found 9 months later. 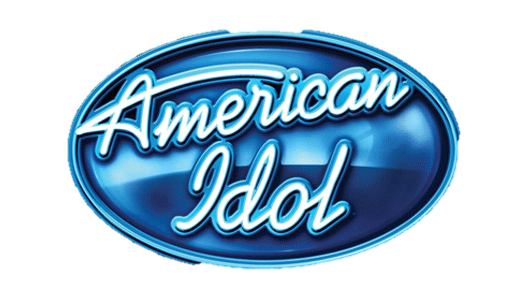 June 11, 2002: “American Idol” created by Simon Fuller with judges Simon Cowell, Paula Abdul and Randy Jackson, premiered on Fox. June 18, 2002: Minnesota Governor Jesse Ventura announces he will not seek a second term. October 24, 2002: Police arrest spree killers, John Muhammad and Lee Malvo, ending the Beltway sniper attacks in the area around Washington, D.C.
November 14, 2002: The film “Harry Potter and the Chamber of Secrets” is released, based on the second book by J. K. Rowling.